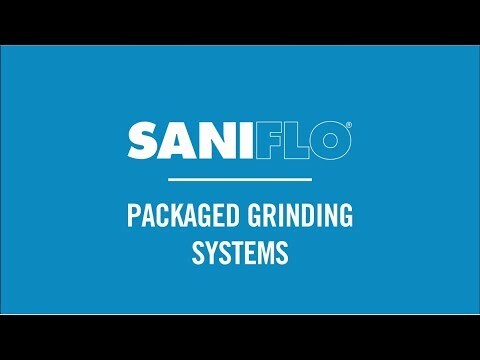 The Sanicubic 1 is a 1 HP heavy duty simplex grinder system used to pump away waste water from several bathrooms and fixtures from an entire building structure. This system is able to discharge the waste up to 36 feet vertical and/or 328 feet horizontal. It incorporates a grinder system which is ideal for uncontrolled environments in both residential and commercial applications (ie. rental unit, offices, warehouses, etc). 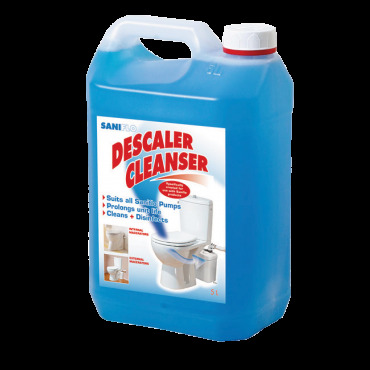 The Sanicubic 1 is designed to handle sanitary products that may have been flushed down the toilet; such may consist of condoms, sanitary napkins, q-tips, dental floss, etc. 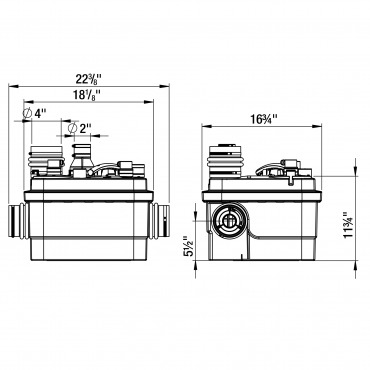 This system consists of a 1-HP motor housed inside a compact but highly durable plastic enclosure. The motor has a high-performance grinding system and a fast-rotating cutting blade to reduce solids in the wastewater stream from toilets, tubs and showers, sinks, washing machines, dishwashers, etc. The Sanicubic 1 operation is as simple as the installation. The effluent enters the pump through one of four different inlets – one on either side of the unit at the bottom and two along the top. The inlets can accommodate 1-1/2” or 4” diameter pipes. As soon as the wastewater level reaches the trigger point, the pumping system activates. The effluent is then pumped out through 1-1/2” diameter rigid pipe connected on the top of the pump. Maximum pumping distances are 36 Ft vertically and/or 328 Ft horizontally. The pump is able to handle up to 50 GPM. 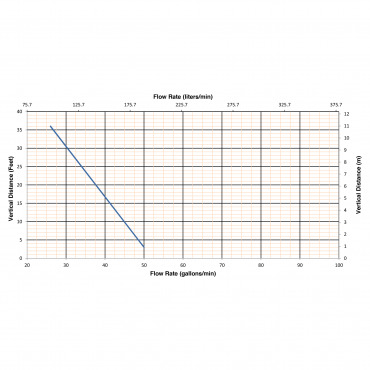 If the incoming rate is higher than the discharge rate, the pump automatically signals the “alarm” stage. This will activate the visual alarm on the pump’s external control panel and the audible alarm from the wired control box (if connected). 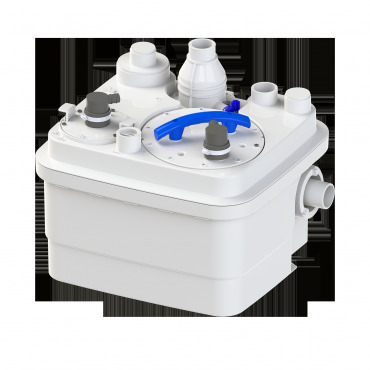 The Sanicubic 1 can be retrofitted into an existing sewage ejector basin of at least 24” in diameter for a quick and easy pump exchange. As this is considered a “plug and play” device, no chains or floats are needed. 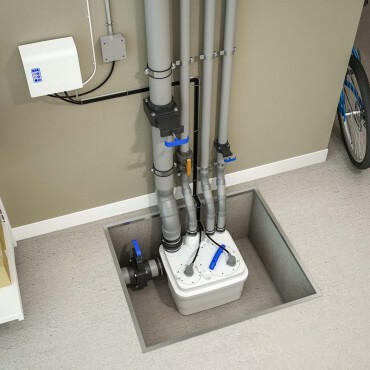 The wastewater from other sanitary fixtures is discharged into the Sanicubic 1 via four 1½-inch or 4” inlets, on either side of the housing and on the top of the enclosure. 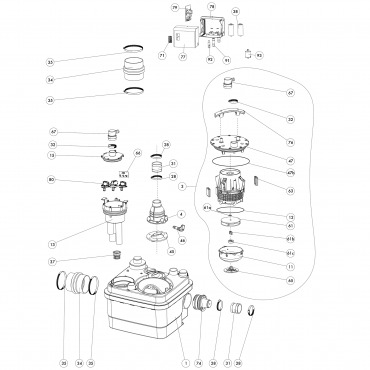 The internal discharge pipe comes equipped with a check valve that prevents back flow into the unit. Isolating valves (ball, gate valves) must be installed on waste inlets and on the discharge pipe to ensure that any service/maintenance may be carried out safely. The Sanicubic 1 is IP68 rated for possible submergence which eliminates any potential water damage to internal components. 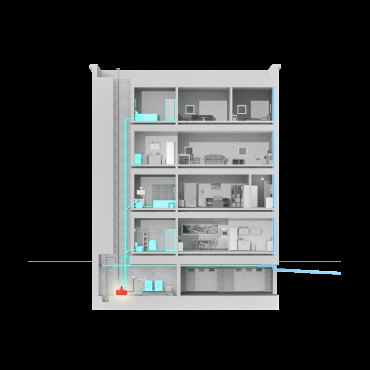 It comes equipped with an external control panel as well as a visual and audible alarm system (15' long wire). The Sanicubic 1 is ordered as a single unit only. No other fixtures are included. 11 3/4" x 18 1/8" x 16 3/4"